On the coast of Mombasa, the Serena Beach Hotel is a resort that will be on anyone’s shortlist of favorite hotels. The resort sits on Shanzu Beach, along the northern coast of Mombasa near Mtwapa Creek. The city of Mombasa and the Moi International Airport are only some 25 km away. The layout of the Mombasa Serena Beach hotel is like a traditional African town, with lanes that wander between the shaded courtyards and market-like squares. The rooms of the resort are housed in small buildings, adding to the feel that the grounds are part of a village. The resort has 164 rooms, all air-conditioned with private bathrooms. You can choose a view of the garden courtyard, or the brilliant Indian Ocean. 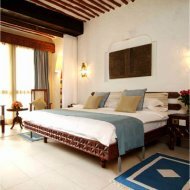 All the rooms are beautifully decorated and furnished with a distinctive African theme. There is also satellite TV, mini-bars, modem connections and private phones in every room. Other services offered by the Mombasa Serena Beach hotel include a complete concierge service, babysitting, laundry, boutique gift shop, and a fitness center with gym, squash courts, spa and swimming pools. If you are lucky enough to be staying at the Serena Beach Hotel on business, there is a 24-hour money exchange service, business center, Internet connections and complete pool of secretarial staff at your fingertips. To offer the fine local cuisine of Mombasa, the Serena Beach Hotel has 5 fine dining restaurants for you to choose from. The Fountain restaurant offers traditional Swahili dishes along with many other international cuisine specialty. This main dining room has a smart casual dress code, so no shorts or sandals. Shaped like the bow of a Dhow boat, the Jahazi Grill can provide you with a taste of fresh African seafood, along with other fruit and vegetable dishes. Local music and entertainment is usually performing at the more casual Sokoni restaurant, that is designed to resemble a busy marketplace. The food is Italian, and the mood is festive. The last 2 eateries are the Piano bar and the Nyota bar, both serve drinks through the day along with snacks and quick food in a very open casual atmosphere. You can also find a famed Maisha spa complex at the Mombasa Serena Beach hotel, offering a wide range of relaxing facials, massages, and other treatments for the ultimate vacation indulgence. There are steam rooms, private outdoor showers, saunas and a professional staff to dispense the latest in spa therapies and treatments. Both men and women will find something to their liking. There’s a free shuttle bus service can take you from the resort into the city of Mombasa, so you can explore the sights of the city. While there, make sure to explore the Old Town neighborhood, and Fort Jesus. Ask at the front desk about all the available activities. You can go boating, diving, fishing, surfing, hiking or swimming. Let the staff help you arrange an itinerary of outdoor fun. The Shimba Hills National Park is nearby, as is the Kipepeo butterfly farm. And you can't miss the Mombasa Marine National Park that is right next to the resort. Compare this hotel with other Mombasa beach hotels at my two favorite hotel sites: Africa Point (the biggest source of Kenya hotels online) or Hotels Combined (the best independent reviewer). 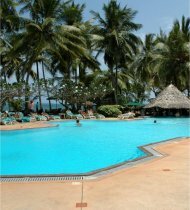 Or read my other reviews of Mombasa beach hotels.